A Turkish court on Tuesday ruled to arrest three editors and one media worker from the pro-Kurdish Özgürlükçü Demokrasi newspaper, which was seized by the Turkish government in late March on the grounds that it has links to the terrorist Kurdistan Workers’ Party (PKK). 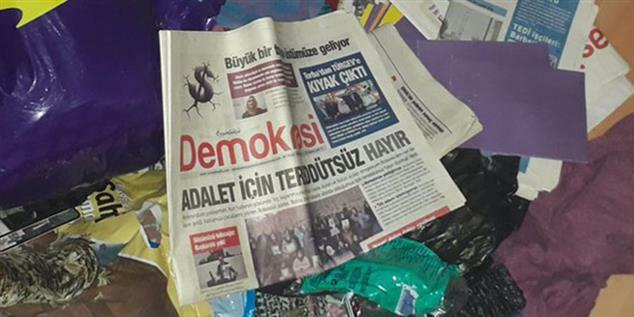 Özgürlükçü Demokrasi is the successor of the Özgür Gündem newspaper, which was closed down by the government in the aftermath of a failed coup attempt in Turkey on July 15, 2016. On March 28, the headquarters of Özgürlükçü Demokrasi in the Beyoğlu district of İstanbul and its printing house were raided and searched by police teams upon an order from the İstanbul Chief Public Prosecutor’s Office. Twenty-two employees of the daily were detained, and 20 were subsequently arrested. Seven others from the daily were detained in another police operation on April 7. Of them, editors Mehmet Ali Çelebi, Reyhan Hacıoğlu and Hicran Urun, and media worker Pınar Tarlak, were arrested on Tuesday on charges of membership in a terrorist organization. The remaining three were released on judicial probation.